Windows 8 is the latest and the most modern operating system from Microsoft, till date. Almost every laptops and desktops today, comes preloaded with Windows 8 operating system. And Windows 8 is achieving popularity, but at a low pace. If you are using the Windows XP operating system on your computer, then it's the time to upgrade your operating system, as Microsoft will be cutting off all technical support for Windows XP operating system by mid-2014. Even if you're using Windows 7, it's better to upgrade Windows 8, as its latest operating system. However, the only con of the Windows 8 operating system is that it has a “Touch-Optimized” user interface. And users having Windows 8 operating system on non-touch devices like Desktops, won't feel the Metro UI and similar settings useful. But, there is a way for Windows 7 users to install Windows 8 on their computer, without actually deleting Windows 7 operating system from their computer. So, you will be able to switch between Windows 7 and Windows 8 operating system's on your computer but that can slow the startup process in windows 7. For solving that, you should speed up the startup process in Windows 7. And today, we will be guiding you through the complete process on how to Upgrade Windows 7 Computer To Windows 8 Using Dual-Boot Method. Please make sure that your computer running Windows 7, has all technical requirements to install Windows 8. First of all, make sure you have the .ISO installer of Windows 8. Now, burn the .ISO installer of Windows 8 to a DVD. Now, we need to create a separate partition of your Hard Disk, to install the Windows 8 operating system without deleting the Windows 7 operating system. For this, navigate to the “My Computer” on your computer. From My Computer, Right Click on an empty space. From the popup box that appears, click on “Manage”. Now click on “Storage” and then click “Disk Management”. Now, you will be displayed with a box, with displays all available storage drives on your computer. 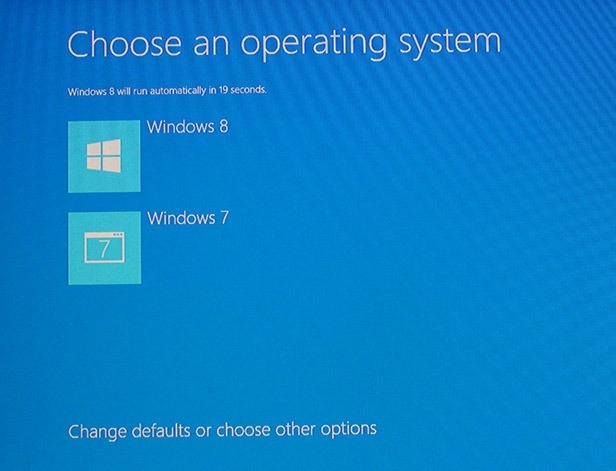 Now, from all the disks available on your computer, choose a disk to install the Windows 8 operating system to it. Make sure that your disk has at least 20 GB of free available storage space. Now, right click on the disk that you chose to install Windows 8 on, and click on “Shrink”. Decide the amount that you would like the Windows 8 to use, and confirm. Now a black bar will appear on top, titled “Unallocated”. Click on that bar, and keep proceeding by clicking “Next” until you see the “Format Partition” part. Complete the “Format Partition” process using the default stuffs. Give it a name. Name something different, so that you can identify it later. For the sake of our tutorial, let's name it “Windows 8”. Now, reboot your computer with the DVD disk entered. While booting, you'll be asked to “Press Any Key” to boot from CD/DVD. Press any key from your keyboard. Choose your language, and install the Windows 8 operating system. After installation, enter your Product Key to activate your copy of Windows 8. Now, From the setup screen choose “Custom”. Now a listed of your available drives will appear, select the drive that you named “Windows 8”. Now, wait patiently until the Windows 8 operating system installation completes. Phew! Now you have successfully installed Windows 8 on your Windows 7 computer. Now, whenever you start your computer, you'll be asked on the startup screen whether to boot as Windows 7 or Windows 8. And enjoy! How to Remotely Shutdown or Restart a Windows Computer? A zealot author, a story teller and a Philocalist who loves to write on various topics trending on social media. She's a work in progress and a budding visual artist. I have done all the steps as you mentioned in your post. But i get that (ndis.sys) error so please help me. Well Written Post with step by step procedure. No matter how fast your new computers might be, they all seem to get slower over time. Because there is a new kind of excitement to play with a new computer and to install lots of software on it. The first program which we install on our new computers is anti-spyware and antivirus tools, to stay from viruses. I know, it's an essential program but what we actually do, we install more than one antivirus program. Next, we download lots of unrecognized junk software from the internet. Obviously, your new computers gradually decrease the performance and one day when you are trying to open a program or file then it takes more time to open up. So, Whatever the cause, there are lots of ways to speed up Windows 7 performance and make your PC work better without upgrading your hardware. Here are something that will help you in installing Windows 7 custom themes. The glass transparency uses more resources of a PC from the Aero feature, you can disable by following simple steps. Step 2: Click on the Window Color icon at the bottom of window. Step 3: Uncheck the box to disable transparency. Step 4: Click on save changes. This will save some resources from being utilized and Speed Up Windows 7 Performance. You have to turn on only those visual effects that are essential and required by you. 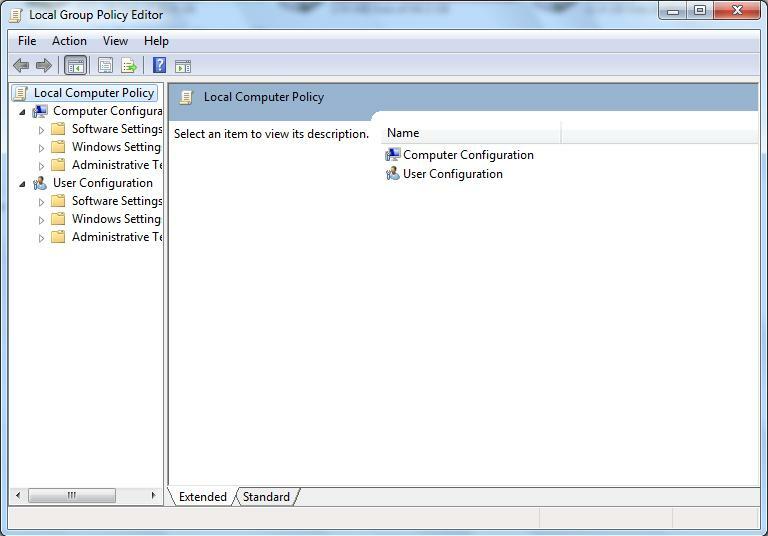 You can optimize how menus and windows appear by following simple steps. Step 1: Open My Computer > Click on System Properties >Click on Advanced system settings (left hand side). Step 2: A small window will open up and from there go to the advanced tab and click on settings (performance). Step 3: Now here you can go for any of one option. Option 1: Click on checkboxes as shown in the image below. Step 4: Click on Apply. This option will tweak your storage devices such as internal disks or removal drive to give the highest possible performance, to enable just you need to follow the below simple steps. Step 2: In Device Manager, click on disk drives to expand the attached drives to your computer. Here I have two drives, one is the internal hard disk and second is pendrive. This will surely optimize the usage of cache memory and Speed Up Windows 7 Performance. Windows 7 comes with lots of features and we all know that we are not using all the features of it so it also allows us to turn on or off Windows features as per our requirement. That will also speed up the startup process for windows 7. For that, just follow the below simple steps. Step 1: Open the Start Menu, type Windows Features in the search box, and press Enter. Step 2: Open up “Turn Windows Features On or Off” icon. In that, if you want to turn on any features then tick the check box otherwise untick the check box to disable the features. Step 3: After turning on or off, you will have to restart your PC. That's it. Helps in reducing unnecessary usage of CPU and Speed Up Windows 7 Performance. Disabling GUI boot literally reduces the startup time of Windows 7. Follow the simple steps to Increase Startup Speed Windows 7. Step 1: Open Command Prompt (Win Key + R) > type “msconfig” > Enter. Step 2: Click on the boot tab > Select your OS (Ex: I nave Windows 7). Then, below you will see many options from that check the box of “No GUI boot” and “Make all boot settings permanent” > Click Ok. I will ask for confirmation click yes and restart. When it comes to surfing the internet, the first browser which strikes through our brain is Google chrome and we have countless reasons for liking chrome. It is really easy to navigate, clean and elegant, fast, its offers a huge number of plugins and extensions and many other. One of such features is the ease to block a website. Do you know how to block sites on chrome? Chrome block website feature comes inbuilt and there are several other add-ons which allow us to block websites chrome. We can do it very easily. In this tutorial, we will be teaching you multiple ways on how to block websites on chrome. Although, the internet is a great medium to get connected to the world and access tons of information. But unfortunately, there are several unappropriated websites and contents as well, which we don't want our children or sensitive persons to get access to and the only way we left around is to block such websites. You can block a website on google chrome if and only if you know how to block a website. Your visit on this page confirms the fact that you need to learn the ways to block a website on chrome. So, without getting fuzzy, let's head over to the guide! There are multiple ways you can block a website on chrome. The first method by using chrome built-in feature and the other method is by using several website blocking extensions. We will cover here both the methods. 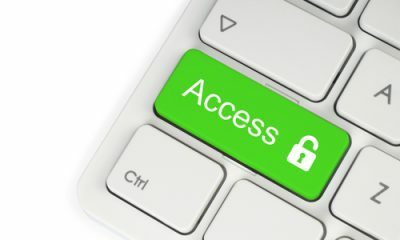 To block a website using a google chrome built-in feature, you need to create a separate account with limited user authority. For this launch google chrome browser and click the three line on the top right corner and go to Settings. Now click on Add person under People. 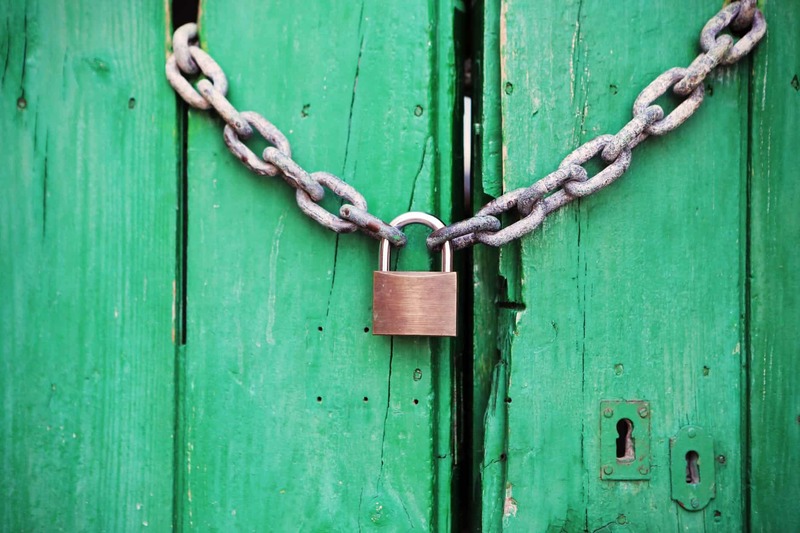 To block a website, log in to your google account by entering the credentials. After that, go to Manage> Permissions. Now do the needful changes there i.e entering the website URL you want to block and apply the changes. You will get to know all the settings once you visit supervised user dashboard! Now let your child access this account with limited access to the website and keep them secure from inappropriate contents. If you want an easier way to blocking a website and creating a supervised account doesn't seem a good choice to you, then use the below-mentioned steps and get your job done faster than ever. This method will show you how can we block a website on chrome using different extensions. SiteBlock is one the best extensions for blocking a website. Blocking a website via site block is extremely easy. You can block a website and show a static page or can redirect it to another website you want. You can set one redirect website for all the blocked websites or separate website for individual pages. This way you can not only block a website but can have a full control over what website should your children visit and what not by redirecting them to some relevant page. To block a website on chrome using this extension, Open chrome browser and go to Settings> More Tools> Extensions Or simply go to this URL chrome://extensions. On the extensions page, scroll down and click “Get more extensions” link. Now search Site Block there and install it on your chrome browser. Once the extension is installed, just visit the website you want to block, right-click anywhere on the page and go to Block Site and select Add Current Site to Blacklist. You can even directly block a website from the app itself without even visiting the website. Moreover, this extension lets you set the time intervals and days on which you want to block this website for. Another great feature offered by ‘Site Block' extension is password protection. One of the basic reasons for blocking a website is to protect children from accessing adult and inappropriate websites. When you install this extension or any other extension for blocking a website, chances are for this extension to get uninstalled by your children or any other member of your family. Hence, password protection is a feature which comes out really handy. You can easily password protect this extension and can have more control over the websites and the extension. Another extension for blocking a website is Stay focused. It is one of the great alternatives for Site Block and helps you block a website in extremely easy steps. I won't teach you how to use this extension because once you'll install it on your chrome browser, you won't need anyone's help to deal with it. Nanny is an advanced extension for chrome users which lets you keep track of the hours you spent on a particular website. Also, it blocks a particular web site after the time duration you have set on this extension. It cares for you as a nanny and keeps you focused while working. Because we all want to concentrate more on work but not on social websites like facebook and twitter. But unknowingly we do just opposite of it and spend hours unaware of the time wastage. This extension not only helps you but you can also keep track of your child's activity. These are just three extensions I mentioned. There are many other dedicated google chrome extensions which offered the same service of blocking a website. Just remember, learning how to block sites on chrome is really important. If you don't use this feature now, probably you'll need it in the future. Because the Internet is surely a blessing to humans but at the same time, it is highly risky for children and sensitive people. It's full of inappropriate contents which should not be accessed by delicate souls. So with this, I'm wrapping of this tutorial, you can leave your comments below in the case of any doubt. So, you want to know how to watch Game of Thrones online, right? Given that it is a premium series from HBO, finding a way to stream the same online is one hell of a task. Still, I have found a few methods to do it. Some of them want you to visit live streaming sites. Not every link on such websites works, though. Yeah, you can watch Game of Thrones free online. I have included both the free and paid ways as well. Shall we begin? Here you go! There are multiple ways to stream the series online. I have picked up a few and coined them to make this post. You can read each one of them below. I know you are not going to like this. Still, HBO Go and Now are two popular methods used for Game of Thrones online streaming. Maybe, you are also using it and need a free way to eliminate the expense. HBO Go and Now are not completely different services. The former needs a cable TV subscription whereas the second one is a standalone service from HBO. The cost for each of them varies. The cable TV provider determines the cost of HBO Go for you. It can start from as low as $15 per month whereas the charge for HBO Now is fixed. 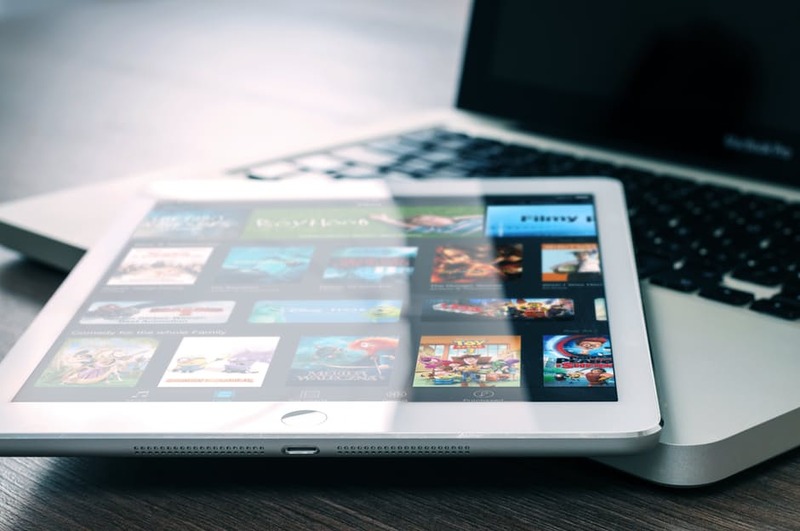 You can get access to both the services using multiple devices including PC, Mac, iOS, Android, Play Station, Xbox, Roku, Apple TV, Android TV, Chromecast Amazon Fire TV etc. The best thing about these official services is, you can avail the latest episode of the series as soon as they send it on air. You can watch previous seasons and episodes as well. With HBO Now subscription, you will get access to a talk show called After the Thrones, in which Andy Greenwald and Chris Ryan are featured. You may be exhausted with the premium options to watch Game of Thrones. Maybe, you might have cursed me for giving you a paid option at first. Don’t worry! You can use watchseries.li to watch Game of Thrones free online. Just follow the steps given below for that. Step 1: Obviously, you have to visit the site watchseries. Being a free online streaming site, it will show some advertisements. You need to be patient given that what you get is worth $15 per month. Step 2: What you see once you visit the website is given below. You can see the search field just below the top navigation bar, can’t you? Type the name of the series (game of thrones here) into it and press enter. (Most probably, it will show suggestions among which you can choose the right one). Step 3: I have checked about half a dozen sites. Some of them lack Game of Thrones. Some others contain only one series or a few episodes. Unlike all, watchseries has all six seasons and the entire episodes in their database. Just select the episode you want under the appropriate season, and you will be presented with a ton links (literally). All of them answer one question; where to watch Game of Thrones. As I said earlier, not every link on the episode page may work. And for the working links, you may have to sign up for an account as well. The best way to find working, no-signup links is trial and error. Click on each one by one and, you will get to know which one works and which one doesn’t. If you don’t mind paying a few bucks to watch a fantasy thriller series, you won’t have to ask where can I watch Game of Thrones anymore. I have got a convenient method for you especially if you are an Indian. Have you heard of Hotstar? If you are from India, I know you might have used it multiple times to watch cricket and football. Most of you would have visited it to watch Olympic games as well. Do you know Hotstar gives paid subscription to Game of Thrones? Yeah, you just heard it right! You need to be a premium subscriber at first. Don’t worry! It will not charge you a whopping amount. All it takes is 199 INR per month. The best thing about it is you can avail the service free for the first month. Step 1: Click on this link to bring you to the paid subscription page. Step 2: Hit the Start Your Free Trial button. You will have to provide your email address and a password then. It is also possible to sign up with Facebook. Step 3: On the next page, they will ask your credit card details. Don’t worry! You can create a virtual card and use it here without any issues. There you go! Once the payment is processed, you will get access to their premium content. Of course, GoT (Game of Thrones) is included in their list of premium media. For Game of Thrones free streaming, you can use any other site. I have got a list of such sites below. Use any of them to watch your favourite TV shows. During my research for this article, I have also found a Google Drive folder with a few series in it. Unfortunately, GoT was not present. 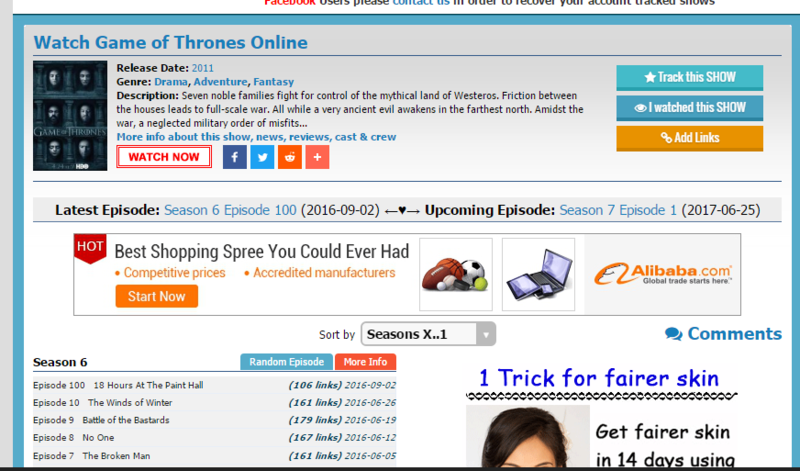 You can search for Game of Thrones online streaming on the sites given above as well. I hope you now know how to watch Game of Thrones online. The links given here may not work as the time goes. I will keep this list updated as we have to witness a few GoT seasons too. Don’t forget to share this article with your friends and followers on social media. They will thank you for doing so. How to Change DNS On Phone? DNS stands for domain name system or domain name server and that's what our today's topic of concern is! 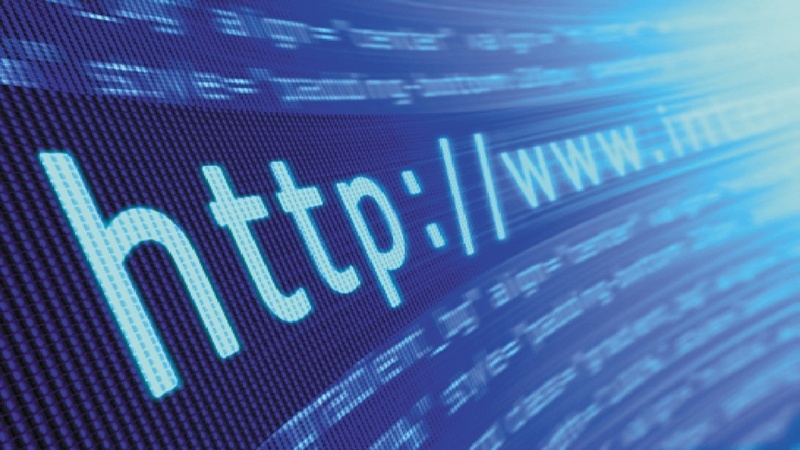 When you get an internet connection on your computer or phone, by default you get provided with the DNS server address from your internet service provider. These settings are mandatory to surf the internet and get access to it. When you use the default DNS settings offered by your ISP, you get limited to the speed, security and other features offered by your internet service provider. But here's is a good news. You are not forced to use the default settings offered by your ISP. You can anytime change DNS server you get by default very easily. Yeah, you heard me right! The default DNS settings can be changed easily and we can use the third party servers anytime we want as per our choice. If you want to know How to change DNS, then keep reading. We have compiled a thorough and in-depth guide on this topic. Before going in-depth of the guide, we would like to illustrate more on DNS. I'm sure you are also eager to know more about DNS settings and the different methods to change DNS settings on rooted as well non-rooted phones. The reasons to change the DNS settings on phones can be distinct for everyone and can vary person to person. It could be speeding up the internet, it might be the security reasons like phishing protection or something similar. Or possibly you want to set parental controls over your internet like you are a parent and you want to have more control over the internet for your kids to be safe. The reason can be anything, we won't go much deeper into it but we will sure have a look at what DNS settings actually are and how can we change them. Every website we visit over the internet has an IP address associated with it and these IP addresses are crucial to have a correspondence between the servers. But we usually know the website with their domain name. For instance, when we visit a website on the internet, we know the website by the name like www.example.com. But in actual, we need to know the IP address associated with that domain name in order to visit it. That's where DNS plays its role best. The DNS is internet's system for fetching out the IP address of the website from its alphabetical name. When we type any website's URL on the browser's address bar, the DNS servers bring out the IP address of the website required for that website to get open. The method to change DNS server settings might vary from the rooted to the non-rooted phones. Regardless of which phone you have, we have provided both the methods i.e for rooted ae well as non-rooted phones. Even if your phone doesn't have root privileges, you can still change the DNS settings. But remember, the below method to add custom DNS settings is only applicable for your wifi network. If you want to set custom DNS for your 2G/3G/4G or other similar networks, you need to use an app called DNSet. The method od using this app is described below. But before that, let's look into how to change DNS settings of the wifi on your home network without using any third party app. First of all, go to Settings on your phone. Scroll all the way down to wifi and tap it. Now from all the available networks list, long tap on the network you are currently connected and select the option Modify network. Or you can directly reach to this option by long tapping wifi shortcut, located on the top of the notification area on your android. After selecting ‘Modify network', you'll see two check box options. One of them is Show advanced options. Select this option and scroll down to IP settings. Tap IP Settings and make it Static. Scroll down again and change DNS1 and DNS2 to your desired DNS servers. Once done, save the settings. If you don't want to limit yourself to the wifi network only, you can use an app called DNSet. A free version of this app is available on the google play store. By using this app, you can easily change the DNS settings of all the networks on your phone including wifi, 3G, and 4G. But again there is a limitation with this app. The free version of DNSet app lets you set your DNS to Google’s public servers only. If you want the freedom to add custom Domain name servers, you'll have to go premium. If your phone is rooted, no need to be affright. We have described the method for changing the DNS settings on the rooted phone as well. Just go through the below steps. Go to google play store and download an app called DNS Changer. Simply run the app on your rooted phone and you'll be provided with a long list of DNS servers available to be used. You need to select any two of them. Once done, the DNS Changer app will show the success message. That's it. The very next moment DNS servers on your phone would be updated. When you'll go to play store, you'll see two apps with the same name DNS Changer. You can try out both on your own to check which one works better for you! Now since you know how to change DNS on your phone, you don't need to stick to the default server settings at all. By following the guide, you can easily change DNS on your phone and can get benefits of the third party servers. Locker means a safe place where you can put your personal or important things hiding from others. We all have some things which we don't want to share with others same as in the computer you have any important data that you want to hide from the outside world. For that, there are many software available over the web and as well as well-known by you so no need to describe it. But if you want to lock your Hard Drive partitions without any software then? In that case, Microsoft has provided one wonderful tool known as “BitLocker” in Windows Vista, 7 and 8 for encrypting your entire Hard Drive partitions. Using BitLocker you can lock any volume on the computer even the one you boot from. But a question arises in your mind that How to use it, right? So, I will show you two different modes to use BitLocker on your computer. If you wanted to Defrag the Hard Drive, you should see that. 1. How to use BitLocker on a normal/data volume? A simple way to enable BitLocker – right click on any volume and select “Turn BitLocker on” to start the locking process. After clicking a window will pop-up (as shown in the figure below) asking to enter a password to use with the drive – you will also ask to say a copy of the recovery key somewhere at safe place and then it will begin encrypting your drive. By this method you can lock all the drives on your computer except “C:/ drive” or “Boot partition”. Yes, it is true that you can encrypt the main operating system drive, but this has some special requirements since the drive has to be unlocked before boot. First of all this requires that Windows has a seperate boot partition that isn't encrypted; in case if you don't have then create a separate boot partition. The second requirement is that your system include a TPM (Trusted Platform Module). If you try to encrypt your boot volume without satisfying the above to requirement then it will give an error as shown in the figure below. So, in that case you will need to configure your system to use BitLocker with a TPM. Here is how you can do that. 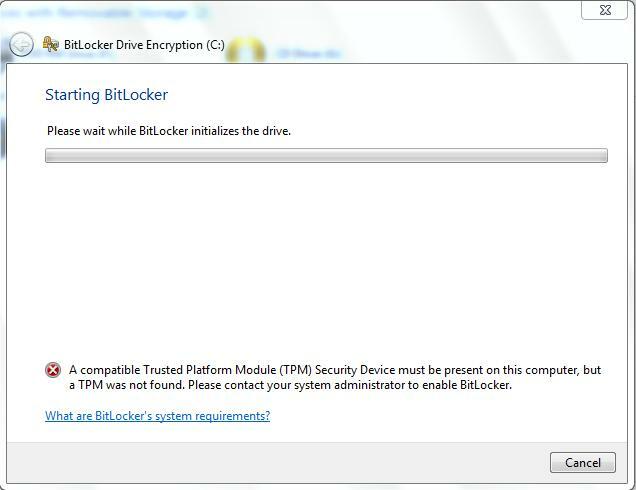 In that please check the below options that “Allow BitLocker without a compatible TPM…” is checked. Then, Click Ok – you are done. 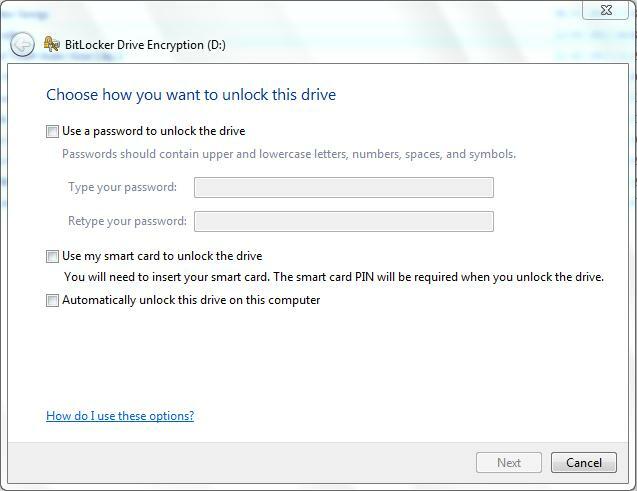 Now you will able to start the BitLocker process on your system drive, and will have the option to either enter a password on startup or insert a USB drive to boot. If you have any problem regarding “BitLocker” then put your comments below so that I can surely help you to get rid out of your problem. Hope this guide helped you to understand how to use BitLocker. PC taking more startup time? Change the Startup program to boost the startup process in windows 7.